There are stupid people in this world. And then there are people like Susan Cole. Susan Cole was called for jury duty last June in Denver, Colorado. Like most people, Susan Cole did not want to do jury duty. So, she established an elaborate hoax to get out of jury duty. She came to court with an extreme makeup malfunction, hair in curlers, slurred speech to give the impression she was mentally ill, and claiming she had post-traumatic stress disorder. The judge quickly dismissed her from the case. Now, if Susan Cole had been able to keep her mouth shut, that would have been the end of it. But, no, she couldn't do that. In fact, Susan Cole got on a radio talk show and bragged how she got out jury duty. That was bad enough. But, even worse for Susan, the presiding judge who dismissed her from jury duty was listening in that day. She was arrested and charged with perjury and attempting to influence a public servant, both Class 4 felonies. The link I provided (above) goes into detail how they tracked down Susan Cole. This story reminds me of an incident when I had to appear for jury duty back in August of 1984, before the internet took off with guns blazing. The jury pool was called to order by the bailiff and as soon as the judge was seated, he asked for all excuses to be brought forth now. Of course, it was like a tidal wave heading toward the judge. People had various excuses from a bad back to poor English comprehension. You name it, it was brought forth. But, one young guy, I guess in his mid-20s, gave the excuse he could not read or write. A woman sitting next to me whispered, "No way the judge lets him out on that. My 87-year old grandmother couldn't read or write and she still had to do jury duty." We both chucked on that little fact. The judge looked very sternly at the young man. "So, are you saying you cannot read and write?" the judge asked. The judge repeated this question three times. He ended the third and final time with "Are you sure?" None of us could understand where the judge was going with this. After the young man repeated firmly he could not read or write, the judge said he would let him off jury duty. We were shocked!!! But, the judge was not finished. "By the way, young man, did you catch the score of the Atlanta Braves game last night? The obviously pleased young man said, "Sure judge! It should be right here in the Sports Section." The young man pulled out a rolled up newspaper he thought was hidden under his jacket. When he did that, everyone in the jury pool room busted out laughing!!! The judge did not think it was funny, however. He ordered the bailiff to detain the young man and have him arrested for perjury (lying to a district judge is considered perjury). The judge then asked if there were any more excuse makers who couldn't read or write. 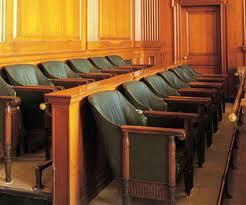 Everyone up there, in front of the judge, suddenly decided they wanted to go on jury duty. It just goes to show you need to do your civic duty. If you are really unable to fulfill your civic obligations, that is one thing. But, making an invalid excuse that could land you in hot water is an entirely different matter. Think about this post next time you get that dreaded summons in the mail.